Optiemus Infracom, a distributor and manufacturer of Blackberry smartphones reported that the Blackberry Key 2 LE now made its way to the Indian market which will be available for purchase from October 12 exclusively at Amazon.in. Qualcomm Snapdragon 636 SoC, 4GB RAM, a QWERTY-based keyboard, Android 8.1 Oreo, dual rear cameras, 4.5-inch, and fingerprint sensor is positioned on the space bar are some of the highlighting features of Key 2 LE. The quite interesting part is that Key 2 LE is cheaper than key 2. To recall, the Blackberry Key 2 LE was initially unveiled at IFA 2018 in Berlin in the month of August. In the US market, it was launched at $449 (approximately Rs. 31,900) in three color options including Atomic, Champagne, and Slate. While addressing at the launch event, Hardip Singh, Executive Director of Optiemus Infracom, stated in a press release, "Security and privacy are becoming priorities in our data-dependent world and at Optiemus, we are committed to offering our customers a trustworthy mobile experience. 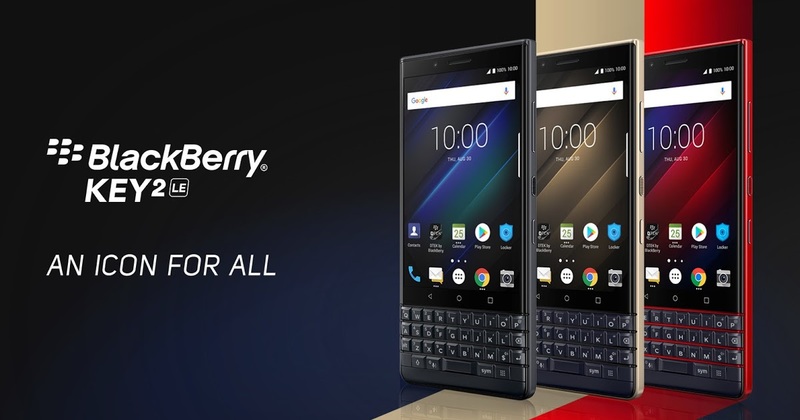 We are delighted to launch the BlackBerry KEY2 LE, further strengthening our portfolio of the most secure smartphones in the country." In India, the BlackBerry KEY2 LE comes with a price tag of Rs 29,990. As we already mentioned that it will be available for purchase exclusively at Amazon.in from October 12. It must be noted that it will be available in Space Blue color options. The BlackBerry KEY2 LE features a 4.5-inch full-HD+ IPS LCD display with the screen resolution of 1080 x 1620 pixels, 3:2 aspect ratio, 434 ppi pixels density and 24-bit gamut color. It runs on Android 8.1 Oreo out-of-the-box. In terms of hardware, the Key 2 LE comes with a Qualcomm Snapdragon 636 SoC coupled with 4GB RAM and 64GB internal storage. The users can further expand the storage capacity up to 256GB by using a micro SD card. In India, it supports dual- sim. For photography, the BlackBerry KEY2 LE comes with horizontally placed dual rear cameras consisting of 13-megapixel primary sensor which offers an aperture lens of f/2.2, PDAF and a 5-megapixel secondary sensor with an aperture of f/2.4 accompanied by dual tone LED flash. For selfies and video calling, the smartphone gets an 8-megapixel front-facing camera featuring LCD selfie flash and full-HD recording. The Blackberry Key 2 LE 4G LTE supports dual-band Wi-Fi 802.11ac, dual- sim, Bluetooth 5.0 LE, NFC, GPS/ A-GPS, GLONASS, and USB Type-C with OTG. It is equipped with the accelerometer, ambient light sensor, gyroscope, fingerprint sensor on the spacebar, magnetometer, and proximity sensor. The Key 2 LE has a battery back up of 3,000mAh bundled with 18W charger and Quick Charge 3.0 Technology. It measures 150.25x71.8x8.35mm and weighs 156 grams.